I occasionally write at school, in the teacher break room during free hours and sometimes also in class, while the students are completing an assignment of their own, before the lesson starts or during the five minute break between double lessons – that is, whenever I have some downtime. “Even if he’s bad, I don’t mind”, the student said. I said, “Wait a minute. There’s another spaceship captain in this story [the galactic empire has many spaceships and many captains] who also doesn’t have a name yet. He’s actually a good guy and his part is much bigger than this other guy’s. So what do you say if I name that spaceship captain after you?” So I’ve officially tuckerized a student now. Tonight, I attended the launch reading of newleaf 28. newleaf is the English language literature magazine of the University of Bremen. I’ve been on the editorial staff (my official title is sales manager) since forever, though I don’t really do a lot these days. We were at a new venue this time, namely the distinctly steampunky surroundings of the Kulturzentrum Schlachthof, the power station of a defunct Victorian slaughterhouse turned cultural centre in the 1970s. They have a Wikipedia entry, too. If you’re a fan of German punk rock, Die Toten Hosen, one of Germany’s two foremost punk bands, gave their stage debut at the Schlachthof a little more than thirty years ago. I’ve been at the Schlachthof a couple of time, mostly at the restaurant or at the Kesselhalle, the main stage in the basement. The newleaf reading, however, took place in the theater workshop at the very top of the building. Getting up the stairs was its own form of exercise. It was a nice event with the usual mix of poetry, prose, music and stand-up comedy. Plus, it was good seeing my old university pals again. My official write-up will appear at the newleaf website in the next few days. I’ll also upload photos of the event to the newleaf Flickr stream. 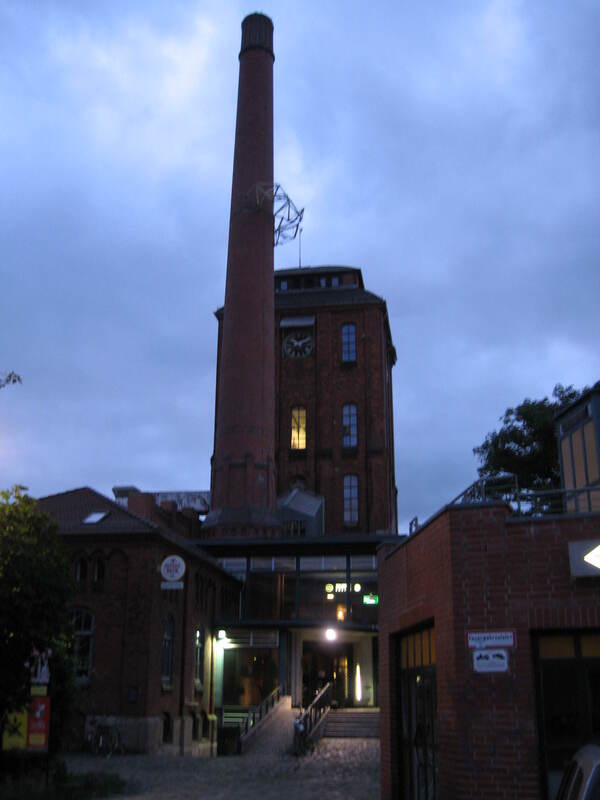 The venue, the rather imposing Schlachthof building, a steampunky Victorian power station that used to serve the Bremen central slaughterhouse before being converted into a cultural center in the 1970s. The dramatic lighting is due to the fact that I took the photo around 10 PM. 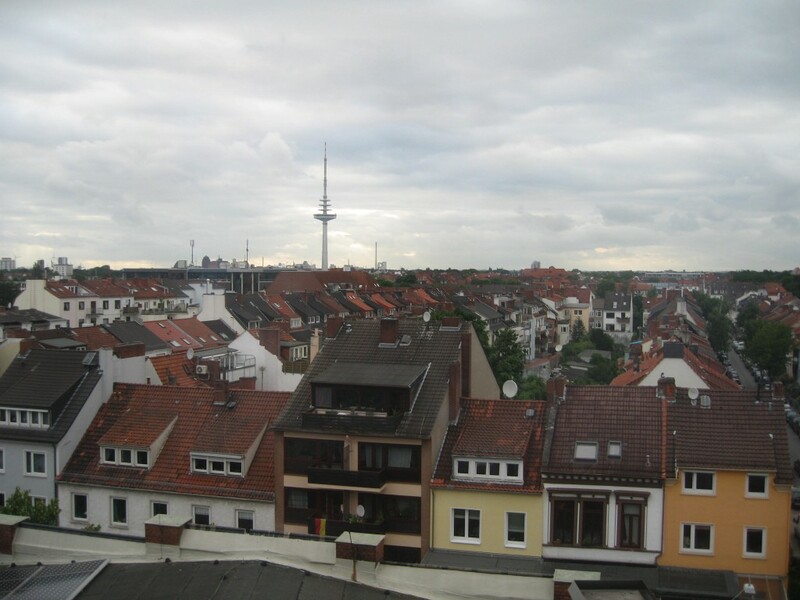 High above the roofs of Bremen, particularly the Findorff neighbourhood. In the distance you can see the radio, TV and telecommunications tower as well as some industrial buildings in the old harbour, including the Roland Flour Mill. 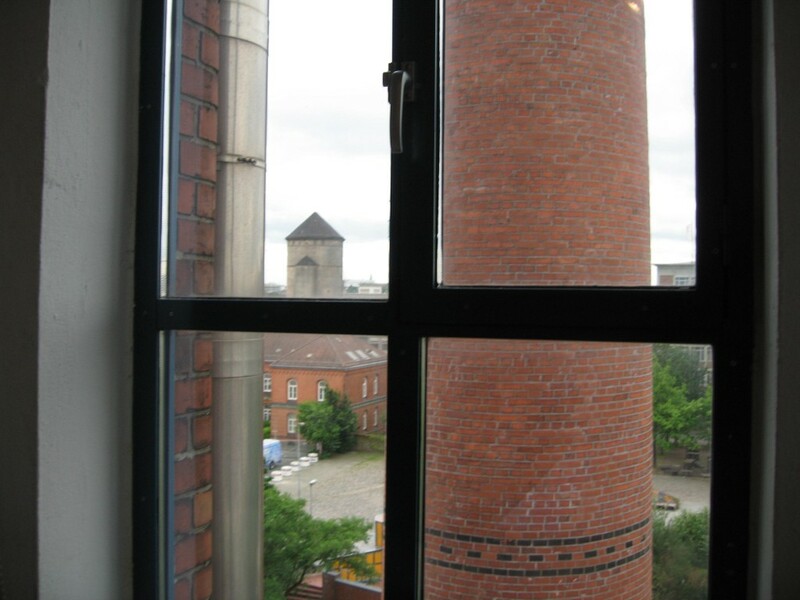 The Schlachthof chimney and an old bunker seen through a window. 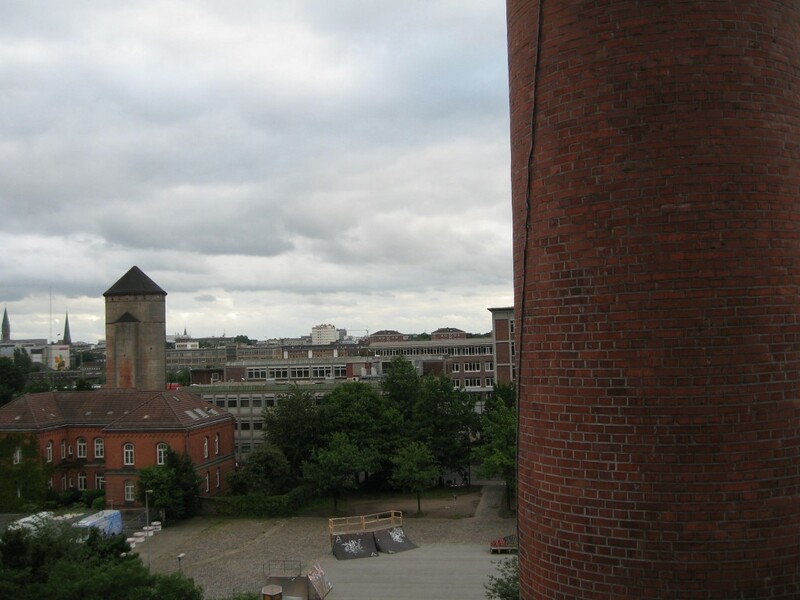 The Schlachthof chimney, a bunker and some other buildings without the window in the way. At the horizon you can see the spires of the St Petri Dom and the St Stephani church as well as the Übermaxx cinema. This entry was posted in Personal, Writing and tagged architecture, Bremen, character naming, newleaf, photos, school. Bookmark the permalink.